Every year, brands roll out the big social media guns on Super Bowl Sunday. And every year, a brand or two get a touchdown, most brands are largely ignored, and some end up investing time and effort in poorly conceived strategies that give those brands a notch in the "Loss" column. This post may be too late, since brands that intend to engage in "real-time marketing" (RTM) this Sunday have been preparing for months. In some respects, even before the kickoff or the first Super Bowl tweet, the die is already cast--the libraries of tweets, posts and images are all awaiting the right moment to be "spontaneously" broadcast. There's no turning back now, but if there is a shred of chance I might positively impact some brands' plans and help them to avoid a big, messy, public misstep this Sunday, I would like to try to help. 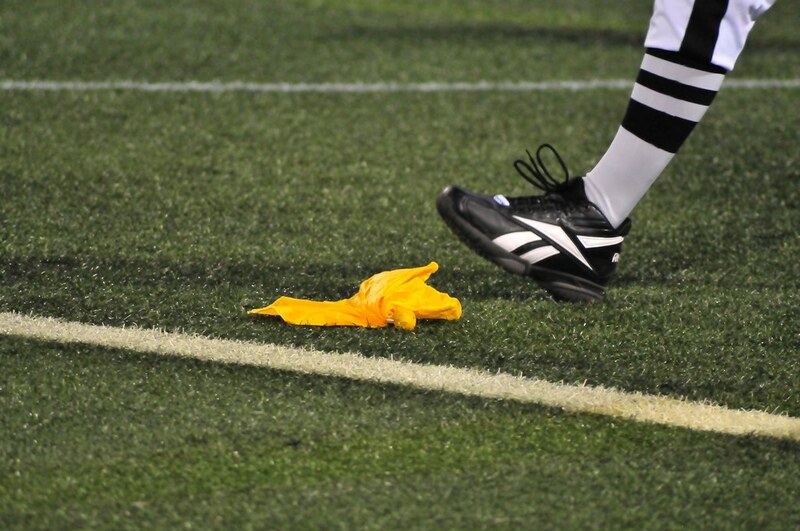 Below are ten tips to help your brand prevent a fumble. I hope you will find all of the tips to be worthwhile, but if I was going to give just one tip, it would be this: Don't do RTM during the Super Bowl. I know, I know--every brand wants to be Oreo (whose "dunk in the dark" post has become the gold standard of RTM) or Arby's (whose Pharrell's hat tweet "won" the Grammys), but the fact is that RTM remains a risky tactic. Brands attempting to hijack consumer conversation about the Super Bowl should not be surprised if their customers resent the advertising-like intrusion. Even if you "succeed," that impact may be modest at best. It can be easy to get swept up into the excitement of retweets and shares, but those are not true measures of business success. Last year, Samsung was said to hit it big with its Oscar RTM, but despite Publicis CEO Maurice Levy's claim it delivered Samsung a billion dollars of value with a single celebrity selfie, Samsung's smartphone market share slipped 25% from Q3 2013 to Q3 2014. Don't insert your brand into every post/tweet during the Super Bowl. Let your intent speak louder than your content. During the Super Bowl, don't robo-tweet identical tweets to numerous different people. That's just annoying. Don't pathetically ask for retweets. Your brand should earn shares, not beg for them. During the event, talk with people. Don't just broadcast to them. Listen--really listen. Don't just make "engaging in their conversation" a euphemism for spam; be real about it. I know you want to get noticed and have your brand appear in the Twitter searches consumers will be using during the game, but avoid inserting consumers' hashtags into your branded posts. Don't be Super spammy during the Super Bowl. During the event, if you have nothing pertinent to say, shut up. Don't tweet just because you want impressions. Be relevant or be quiet. Even though spontaneity matters, have multiple eyes on your Super Bowl tweets. Don't inadvertently embarrass the brand because one community manager fails to realize they are posting something that others may consider offensive or insensitive. Make it a real-time team effort! Don't tweet both personally and for your brand during Super Bowl. Focus--if you're working, then dedicate your full attention to the professional task at hand. Moreover, avoid the mistake of tweeting to the wrong account, a mistake that has cost more than a handful of social media marketers their jobs. Don't pre-schedule posts. A lot can happen during the Super Bowl, both on and off the field. Don't get caught posting tone-deaf tweets and posts that do not reflect and align to what is happening at the University of Phoenix Stadium or the world at large in the moment. Your Super Sunday social strategies should be as much about preventing problems as they are about promoting the brand. If you are not as prepared to deal with potential backlash as you are with going viral, then get prepared fast. Don't be stumbling in a critical moment trying to figure out your brand's tone for backpeddling in the event one of your posts or tweets annoys a number of your prospects and customers. All of these tips can be summed up in this way: Remember that consumers' social conversations are not a marketing channel, no matter what your CMO thinks. You wouldn't interrupt two strangers watching a game in a sport bar to yell, "Hey, our brand is really funny and you should eat our burgers!" Approach your RTM with the same respect for others' conversations that you would in any real-life social situation, and your brand will minimize the risks and avoid mistakes. On Monday, I believe we will be talking as much about the RTM failures and embarrassments as the successes. Follow these tips, and your brand is more likely to be among the latter than the former. It is no secret that today's revolutionary collaborative economy companies present many challenges to established business models and laws, not the least of which are those pertaining to risk. Luckily, new forms of protection--including laws and innovative insurance options--are being developed to cover ridesharing participants. 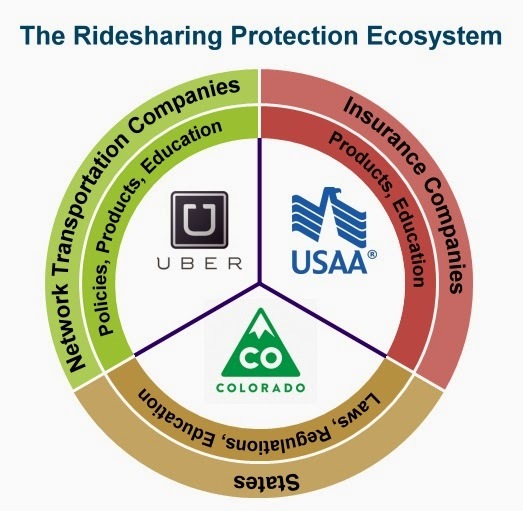 USAA, Uber and the state of Colorado have all taken actions that not only protect consumers but also facilitate the continued growth of sharing economy firms. Their actions demonstrate how Transportation Network Companies (TNCs, such as Uber and Lyft), states (including lawmakers and regulators) and insurance companies can innovate and collaborate to resolve the issues of risk and protection that hinder growth, acceptance and adoption of ridesharing. Accidents are unavoidable, and all three of these parties play important roles in safeguarding drivers, riders and others when they occur. UberX presents a special risk challenge for both Uber and drivers. While UberBLACK, UberSUV and uberTAXI rides are provided by commercially licensed drivers covered by commercial insurance policies, UberX is a true peer-to-peer business model, with private drivers offering rides in their private cars. Personal auto insurance is not priced for the additional risks that come from commercial transportation, and as a result, auto policies exclude these sorts of commercial activities. Uber protects UberX drivers with a variety of coverage while transporting customers. From the moment a driver accepts a trip to its conclusion, drivers are covered with $1 million of liability coverage, $1 million of uninsured/underinsured motorist coverage and $50,000 of contingent comprehensive and collision insurance (with a $1,000 deductible). During the "gap time" or "unmatched phase," when drivers are logged into the app but do not have a fare, there is a different set of coverage offered. This includes protection for bodily injury up to $50,000 per individual (and $100,000 per accident) and up to $25,000 for property damage. This policy is contingent to a driver’s personal insurance policy, meaning it will only pay if the personal auto insurance completely declines or pays zero. While questions remain and some argue coverage must improve, Uber has taken steps to clarify the insurance and protection situation with its drivers. Auto insurance and livery services are regulated at the state and local levels, so TNCs have been working (or battling) for acceptance on many fronts. Last June, Colorado became the first state to pass a law that clarifies issues of protection and risk, permitting TNCs like Uber and Lyft to legally operate. Under the legislation, ridesharing companies will have to obtain permits from the Colorado Public Utilities Commission and carry at least $1 million in liability insurance. In addition, either the companies or their drivers will also have to carry primary insurance coverage during the gap period between when the app is turned on and a rider enters the vehicle. This gap (or unmatched) period continues to cause questions, even in Colorado (much less states without their own similar legislation). For example, Uber has stated in a blog post that "the vast majority of personal insurance policies cover this period either by the plain terms of the insurance policy, or due to the insurance requirements set by state." The insurance industry feels otherwise. Dave Jones, California Insurance Commissioner, notes that "TNC's are under the mistaken impression that personal automobile insurers cover now, planned to cover, or will cover the risk of TNC-related for-hire transportation," The Insurance Information Institute states that "a standard personal auto insurance policy stops providing coverage from the moment a driver logs onto a TNC ride-sharing app." And Esurance agrees, noting that "if a TNC driver is available through the app, they’re driving as a livery service and therefore won’t be covered" by personal insurance coverage. Because of the confusion, some ridesharing drivers try to hide their association with TNCs from their insurance companies. This is risky behavior that places their insurance at risk, and in fact, there have been sporadic reports of insurance companies canceling coverage for ridesharing drivers. The threat of losing insurance is so real that cab drivers in one city, in an effort to buy leverage against the growth of ridesharing, claim to be compiling a database of thousands of TNC vehicle license plate numbers to make available to insurers. Even with the coverage offered by the TNCs and the new law in Colorado, there is a need for insurance companies to step in to help educate and protect their customers. USAA, which has a reputation for innovation, is piloting a program to do just that. USAA is launching a pilot in Colorado that will protect TNC drivers from the moment their ridesharing mobile apps are turned on until they are matched with a passenger. The pilot program, which will begin in February, extends a member’s existing auto policy coverages and deductibles, and costs about $6 to $8 more per month. Colorado provides the perfect proving ground for this inventive insurance product. Not only is it the first state to authorize ridesharing, but Colorado also has a high concentration of USAA members (not to mention a Financial Center and Regional Office in Colorado Springs.) “Ridesharing is a growing industry, and it’s important that our members have the right coverage,” said Alan Krapf, president, USAA Property and Casualty Insurance Group. USAA is not alone in offering novel products for ridesharing participants. Erie Insurance has a new insurance offering that covers ridesharing drivers "before, during and after the hired ride" in Illinois and Indiana. And last May, MetLife announced a partnership with Lyft to develop new insurance solutions to protect rideshare passengers and drivers, although details on those products are still outstanding. Watch for many other insurance companies to follow the leads of USAA, Erie and MetLife with new products aimed at TNC drivers. The collaborative economy still has a lot of maturing to do, and TNCs like Uber are a long way from working out their legal and regulatory issues across the country and globe. Still, the fact that Colorado, USAA and Uber have come so far so quickly is quite impressive, considering Uber was available in only a handful of cities four years ago. This sort of prompt and innovative action is required elsewhere so that riders, drivers, insurance companies, states and TNCs can understand their roles, responsibilities, risks and costs in the nascent ridesharing marketplace. With all the buzz around sky-high valuations for collaborative economy and messaging startups, you may have missed that publicly held social media stocks had a pretty terrible year in 2014. The 11 U.S. stocks in the social media industry--including those in categories such as social networks, ratings and reviews, community platforms, relationship and content management and collaborative economy--lost 19.2% compared to a NASDAQ increase of 14.31%. Of the eleven stocks, just one outperformed the market, only three gained in 2014 and half lost more than a quarter of their value. What does it mean that social media companies are sagging? The problem certainly is not stagnating adoption. Despite the negative press about teens and Facebook, the social network continued to add active users at a steady pace in 2014. Same with Twitter and LinkedIn. And a study by Localytics found that time spent with social media apps rose almost 50% between 2013 and 2014. Financial performance disappointed the market: Considering the amount of time people spend with social networking, you'd think making money would be easy. Turns out it is not. Just three of these 11 companies have a P/E ratio, because only three of them have any E. (That means, only three have earnings in the trailing twelve months--Facebook, HomeAway and Yelp.) Almost three-quarters of these companies are still trying to consistently remain profitable; for example, on a GAAP (Generally Accepted Accounting Principles) basis, Twitter continues to see consistent quarterly losses (although on a non-GAAP basis they have reported quarterly profits). While Groupon, LinkedIn, HomeAway and Yelp flirt with their break-even points, many social companies are nowhere near profitability--at the current rate, Jive may get into the black before the end of 2015, but the same cannot be said for Zynga, Bazaarvoice and Marketo, based on their recent quarterly earnings trends. Facebook is the only social media stock that has been able to demonstrate consistent and growing profitability as of yet. Some social media companies will fail: Pets.com was not a horrible idea--just ask PetSmart, which is aggressively growing its online presence and capabilities. Neither were Flooz, Webvan or many other dot-com companies that flamed out because they were a bit too ahead of the curve. I don't expect all 11 of the companies in my social media portfolio to survive through the next two or three years. Airbnb is well on its way to pushing HomeAway to the curb, and Angie's List may find it difficult to survive in an age of free ratings-and-review sites. Some entire subcategories within the social media industry may simply not be sustainable--given declining organic engagement rates, low acquisition/conversion and the cost of creating content, it is possible marketers may ease or even reverse their trend toward social media marketing investment in the coming years, and that could decimate entire subcategories within the social vertical. Collaborative economy companies will do well in the long run, but the intermediate term will be rocky: The Internet era was won not by companies that relied on advertising (so long Excite, Prodigy, Alta Vista, etc.) but by companies that found new ways to empower digital consumers and companies (hello Amazon, Ebay, iTunes, Oracle, Salesforce, etc.) For this reason, I remain more bullish on companies that leverage consumers' newfound social and sharing behaviors more for commerce than for advertising. But, while collaborative transportation, lending and place-sharing have a rosy future, this year's valuations strike me as wildly optimistic. Uber, Airbnb and others face a host of challenges in the coming year, from improving safety to gaining consumer trust to serious legal and regulatory hurdles. Right now Uber's valuation stands at $40B, which is three to six times greater than Hertz and Avis and approaching that of Ford and General Motors. As we saw with Ebay and Amazon, innovative companies can win in the long run, but we should be cautious in expecting too much too quickly in terms of retention of customers, growth, stable expenses and consistent bottom-line performance. What do you think? Will 2015 be the year that social media stocks turn around, or do you agree that we may be years away from finding the right values for publicly held social media companies?